Now this something that offers much confusion in how to treat the effects of a jellyfish sting. If listening to the old wives’ tales, one would be advised to urinate on the affected area, or if that wasn’t embarrassing enough, get somebody else to do so. Thankfully, the treatment is much simpler and more dignified. Firstly, treat the patient out of the water. Remove any remaining tentacles with tweezers or a stick, wear gloves if available. Rinse the affected area in sea water then immerse in hot water (as hot as can be tolerated) for 30-90 minutes or use a heat pack. Any further pain or swelling can be treated with painkillers, such as paracetamol or ibuprofen. If there are any severe symptoms, including problems breathing and chest pain, call 999 immediately. 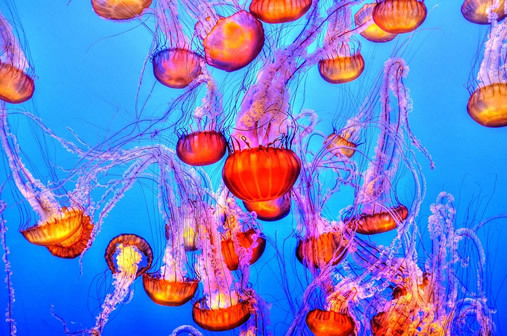 We should not be frightened of these fascinating creatures as venom from the sting of a jellyfish from British waters is very mild, being compared to that of a bee sting. 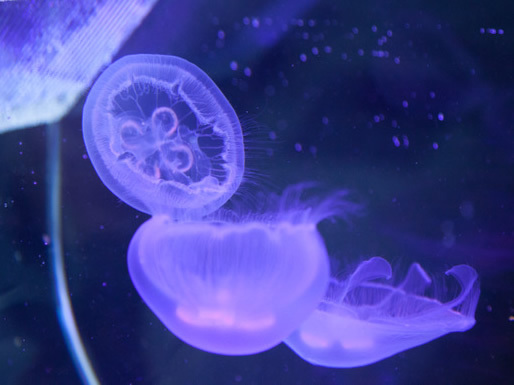 Here at Aqualease we can provide a state of the art jellyfish aquarium with remote set lighting in a range of stunning colours, along with your very own juvenile moon jellyfish, who are genteel and none stinging. Information and activity sheets will also be provided, and all of this is available for your school during half term. So why not learn more about these mysterious creatures by contacting Aqualease on the details below.